Palm Beach Fine Craft Show Will Bring Leading Contemporary Craft Artists to South Florida this February. 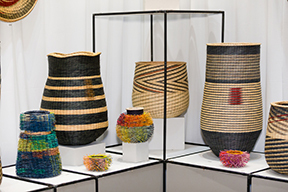 The Palm Beach Fine Craft Show, featuring many of the most revered contemporary craft artists in the United States, is returning to the this February. The much-anticipated event will be celebrating its fifteenth year as a must-see showcase of elegant, one-of-a-kind items. The show is scheduled for February 16-18, 2018, and will once again take place on the second floor of the Palm Beach County Convention Center. Artists will be exhibiting their finest works, including glass, textiles, clothing, jewelry, metal, ceramics, wood, leather, furniture, and basketry. The show will open at 11:00 am each day, and will close at 7:00 pm on Friday, February 16 and on Saturday, February 17. The show will wrap up for the year at 6:00 pm on Sunday, February 18.